Welcome to the first post that focusses on a single flavor. We’re starting with coffee, not because it’s simple—it’s maybe the most complex flavor we’ll have the pleasure of disecting. 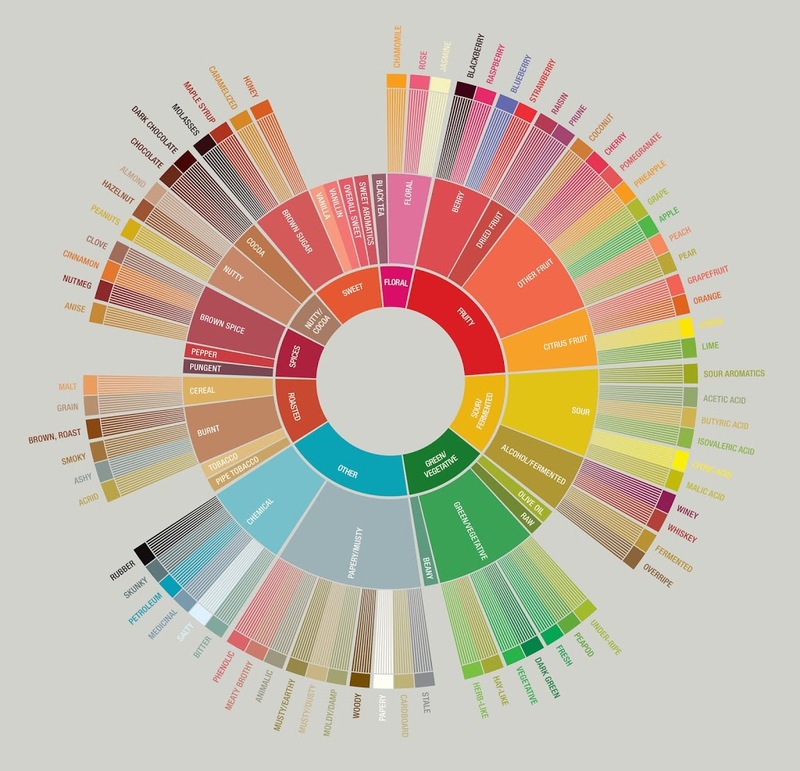 We’re going to take on this complexity because coffee flavor illustrates so many principles, and because there’s a mountain of high quality research already available, at least with regards to making a cup of joe. To make good coffee ice cream you do have to learn to make good coffee. If this were a simple task, everyone would be doing it. Everyone is not doing it. I lived in New York City for about 15 years before having my first truly good cup. Coffee’s 3rd wave took a couple of decades to make it all the way East from Portland and Seattle, and is only just now gaining traction in a culture that’s been long-steeped in the bitter seas of Starbucks, and before that, street-cart swill and Café Bustello. Good coffee starts with sourcing high-quality beans that are roasted with precision and that have whatever characteristics you most enjoy. Differences in regional varieties and processing methods are beyond our scope here. See the links at the bottom for suggested reading. Roasting, however, is of primary importance and needs to be considered. Roasting coffee well is hard. I’ve bought coffee beans from many local, supposedly artisanal roasters, and have usually been disappointed. Sometimes the roasters just have terrible ideas about coffee. Many of these ideas were propagated by Starbucks and other 2nd wave roasters—like the idea that dark-roasted coffee is somehow “bolder” or more serious than light and medium roasts. Dark-roasted coffee is, more often than not, ruined coffee. Once you inch past a full-city (medium-darkish) roast, the aromatic flavors that distinguish good beans from bad ones, and one region from another, are muted, replaced by generic roasted flavors. Roast darker still and those origin flavors are demolished entirely, replaced by burnt flavors and bitter non-volatile chemicals. 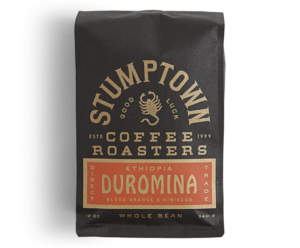 Selling us on dark roasts was a cynical ploy by companies like Starbucks, who figured out that 1) if you roast the coffee dark, your customers won’t be able to tell the difference between good beans and bad, from this region or that one, from beans harvested this season or last. So quality and consistency become non-issues. And 2) if you roast the coffee dark, it will be bitter, and people will want to tame it with sugar and milk. Which means that instead of selling $1 coffees or $3 espressos, you can sell $5 lattés and skim-mocha frapuccinos and other coffee-flavored sundaes that can survive bad ingredients and poor technique, and, (bonus!) will let you to mark up milk for a 1000% profit. Even roasters who attempt proper degrees of roasting often mess up. Because the process is much more complex and sensitive to precise timing and energy-input modulation than, say, baking bread or popping popcorn. And it’s easy to let portions of some of the beans roast more than others. This may lead to coffee that has the overall color and aroma of a proper roast, but upon closer examination will have spots that glisten with oils brought to the surface. The resulting coffee will typically have the basic character of a light or medium roast, but will have burnt / bitter background notes that will always be out of balance. Every attempt at a light or medium-roast coffee I’ve bought from Whole Foods’ in-house roaster has suffered from this. Same with coffee bought from most small shops that roast their own. In the end, looking at the beans only gets you so far. To know for sure you have to taste the coffee. Not living in the Pacific Northwest, I’ve been limited to a handful 3rd wave companies who have built outposts here, and to a very small number of local roasters who know what they’re doing. –Coffee Mob (in my neighborhood. The only mom ’n pop shop I’ve been to that roasts like a boss). I like to buy single-origin beans, because they’re usually the most interesting. Even with espresso (a glorious topic that lies well beyond our scope, because the espresso process doesn’t lend itself to ice cream) baristas have figured out how to work with single origin beans, which were previously believed to be too full of character and fruity acidity to make a balanced shot. Nowadays there’s less reason than in the past to fall back on blends. I also like to look for direct trade arrangements between the roaster and the plantation. Coffee has historically been rife with colonial exploitation, so it’s gratifying to see roasters working with individual farmers and cooperatives, ocassionally even investing in their operations and helping the farmers achieve prosperity and independence. My dream coffee is generally from East Africa, especially Ethiopia, where coffees often offer a magical balance of syrupy body, earthy undertones, fruity acidity, and floral or herbal aromas. I like a lot of flavor in my cup. People who don’t want so much flavor generally tame their coffee with milk and sugar. I do not, unless the coffee is bad, or I’m enjoying a morning capuccino (which is a whole ‘nuther topic). This introduces the basic problem of coffee ice cream—there’s going to be a lot of milk and sugar. Because it’s ice cream. So if you want those coffee flavors to stand up, you’re going to have to put a lot of them in there to begin with, especially the acidic and aromatic flavors that will be most muted. We’ll get to this. But first—how to make a good cup of Joe? Brewing coffee is an extraction process. 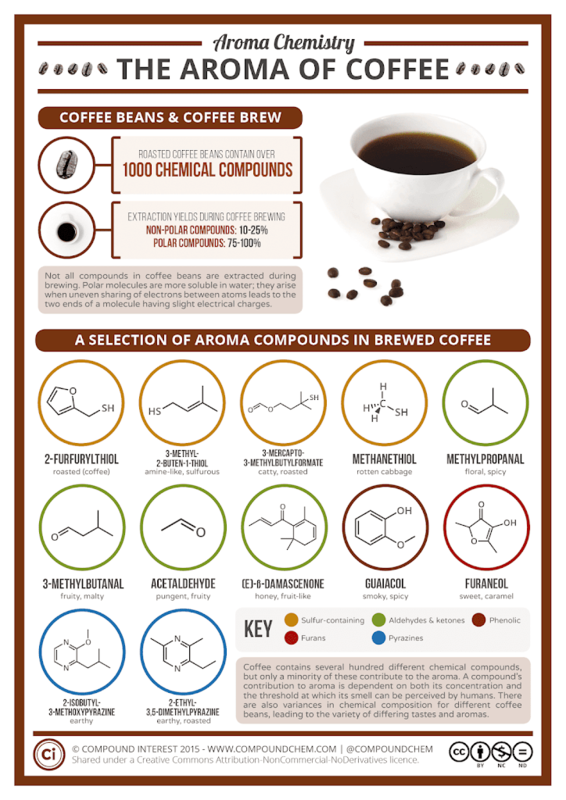 We’re extracting literally hundreds of compounds from the coffee beans, including the basic sugars, acids, and alkaloids that constitute the heavy molecules detected by our taste buds, and also the myriad volatile organic compounds that we detect with our nose. There are other compounds that we either don’t want, or that we want in minute quantities. And among the ones that we do want, we want them in proportions that taste balanced and satisfying. And we want the overall flavor to be strong enough. But not too strong. There’s a lot of information here for a 2-dimensional chart. Allow me to summarize. The two axes represent strength (vertical axis) and solubles yield, or extraction (horizontal axis). Strength is simply the amount of coffee solids disolved in the brewing water, represented as a percentage of the water weight. More = stronger. Solubles yield is what percentage of the available soluble stuff you’ve drawn out of the beans. 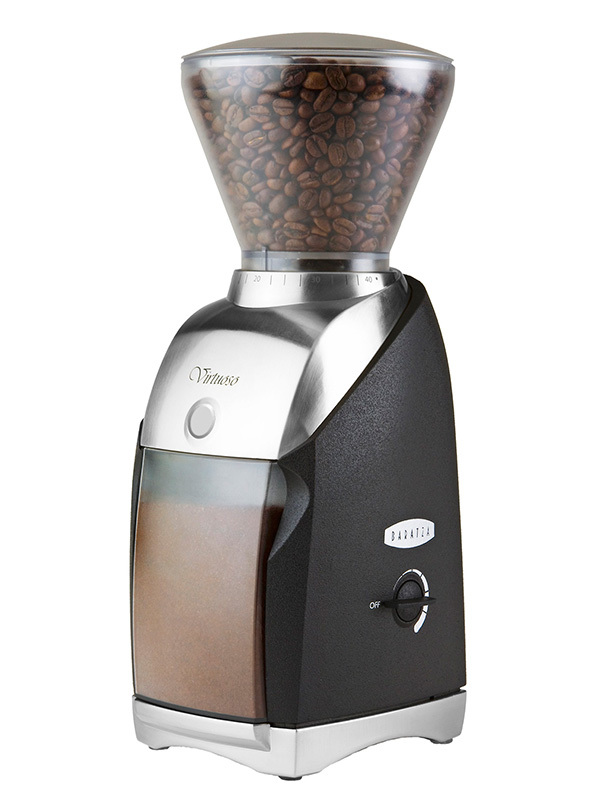 Brewing for a longer time, or with a finer grind (which exposes more surface area) gives more extraction. If you extract too little, you have an “undeveloped” cup, which is typically sour and thin. If you extract too much, the coffee becomes bitter. The diagonal red lines are each for a brewing ratio, which is the actual ratio of coffee beans to water. The lines are diagonal because as you brew longer, or hotter, both strength and extraction of the coffee increase. You control these variables independently by choosing different brewing ratios. For both strength and extraction, there’s a sweet spot, represented by the orange square in the middle. 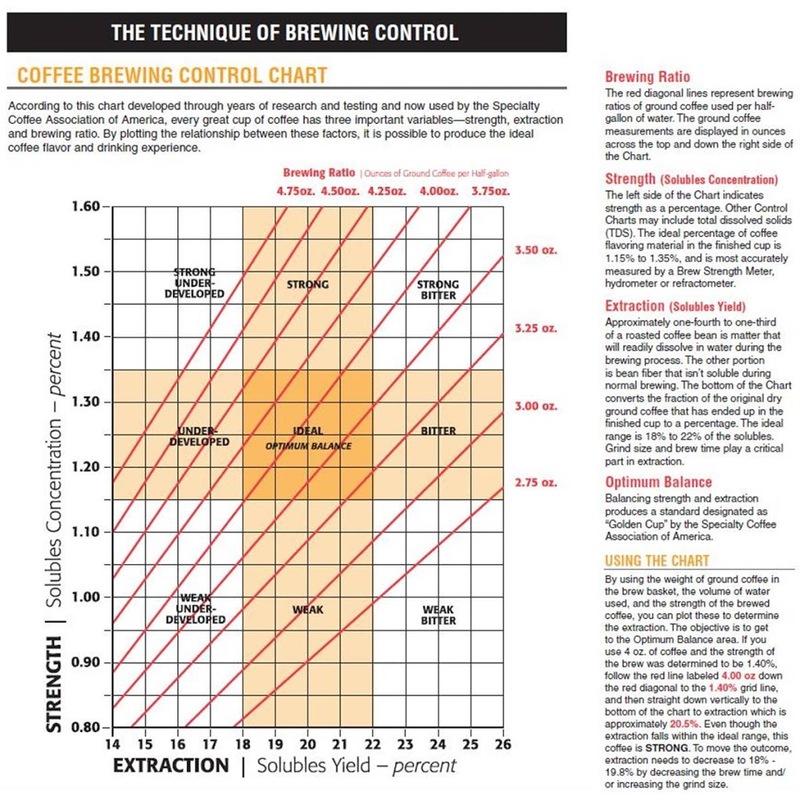 According to the chart, you can get into that zone with any brewing ratio between 3.25 and 4.25 oz / half gallon. Or, if you prefer units that aren’t preposterous, between 4.8% and 6.3% relative to the weight of the water. Without a refractometer or hydrometer, it will difficult to follow this chart precisely. And there’s no need to. Use the chart as a model, to help you understand what you’re tasting, and which variables you need to change when trying to adjust the flavors. If your ideal cup doesn’t land precisely in that square, who cares. The chart does not address the specific factors that determine extraction, which are time, temperature, and grind size. Time and grind size are bound together; the coarser the grind, the more time you need to get to a particular level of extraction. Many coffee making methods determine the general grind size. Press pots require a coarse grind (and so a long brew time) otherwise you’ll clog the filter. Espresso requires a very fine and consistent grind. Drip and pourover coffees cede the control of time to gravity and physics, so you have to find a grind size that works with the time you’re given. See notes on grinding, below. Temperature is also critical. It affects extraction rate, but does not affect all flavor compounds equally. So brewing temperature is an important variable for adjusting the flavor balance. The generally accepted range of brewing temperatures is 90°C–96°C / 195–205°F. Within this range, higher temperatures will give more extraction, more body, more sweetness, more bitterness, and less acidity. Lower temperatures, or course, will give thinner body, more acidity, less bitterness, and less sweetness. Based on my personal experiments, I brew French press coffee at 93°C / 199°F. I use a higher temperature for coffee ice cream. More on that later. What about cold brew? I’ve now had some good-tasting examples, but more often than not find that it’s pretty dull. I believe it’s popular because people are accustomed to bad coffee that tastes burnt and bitter. Cold brew extracts fewer bitter alkaloids from the bean, so without any special skill or even decent quality beans, you can entirely avoid bitterness. But cold brew also results in reduced acidity and aromatics—there’s less there there. More bass notes and roasted flavors. Coffee shops have turned “low acidity” into a feature, not a bug, because consumers don’t know what acidity is. It sounds scary, and is easy to conflate with bitterness, even though it’s essential to a balanced and lively cup. Acidity and bitterness, in fact, have a reciprocal relationship in hot-brewed coffee. More of one leads to less of the other. When making coffee ice cream, we’re interested in increasing acidity and aromatics, not decreasing them. We need to try to punch through the heavy muting tendencies of the dairy and sugar. Notes on grinding: If you want good coffee, you need a good burr grinder. This means a grinder with a hopper on top for beans, a set of conical or flat burs to grind the coffee, and a receptacle for grounds on the bottom. A whirly-blade grinder gives no consistency, so you are you are guaranteed some mix of coffee dust in with your grounds, which will over-extract and cause bitterness. If you’re just making brewed coffee and ice cream, any decent burr grinder will do. Entry-level grinders from Baratza will make as good a cup of brewed coffee as anything (if you’re making espresso—again, beyond our scope—you don’t need a good grinder; you need an awesome grinder. You will spend over $700 or you’re wasting your time. More reason to just go to the café). Your coffee needs to be fresh, meaning roasted between 4 and 10 days ago, stored in an airtight container at room temperature, and ground right before use. If you’re buying pre-ground coffee and letting it sit around for days, you’re sabotaging the process before you even begin. -80g–90g coffee. A good, fresh, light-to-medium roast. Medium-coarse ground, right before brewing (I don’t know how to measure grind precisely. I go a few clicks finer than the coarsest press pot setting. You’ll have to experiement) Concentration: 5.7%–6.4% by weight. -preheat the press pot. pour in a few ounces of water just off the boil, swirl around and dump it out. -fill press pot about 3/4 full. start 4-minute timer. -after 45 seconds, stir vigorously to break up the foam and raft of grounds on top. chopsticks or a palette knife work well. -fill the rest of the way. cover. -brew 4 minutes total. stirr again briefly. press the plunger. -immediately drink or decant to cups / a prewarmed thermos. Note on brewing methods: I use a press pot, because I like a lot of body, and because I like the control it gives over every variable. Many other brewing methods are capable of equally good, but different results. Some methods, like percolation, are not capable of good results. French press most closely resembles the process I’ll recommend for coffee ice cream, so it offers a good frame of reference. It took 21 versions to get this right. The goal was to preserve the full spectrum of flavors and aromas I get from a great cup of brewed coffee (like from the above method) or from a great cup of espresso, and to somehow have it complemented by, not demolshed by, the sugar and dairy of the ice cream. *Use the best quality milk and cream you can get. Nothing ultrapasteurized. Low-temperature pasteurized is ideal. Homogenized products will give best texture. Avoid cream with added stabilizer (unknown variables). Dry milk must be 100% skim milk solids, processed without high heat. There should be no off odors either when it’s dry or when it’s mixed. Store sealed in freezer. **Or substitute 5g fructose powder, and add an additional 5g dextrose. ***Ideally use a Pedro Ximenez sherry vinegar, which has aged and savory notes that complement the midrange flavors of coffee. The darker the roast, or the lower the acidity of the coffee, the more vinegar will be useful to balance the flavors. adding (or partially substituting) citric acid can help shift flavor to a brighter / sharper acidity. This may be helfpul if your coffee is lacking in high notes. -thoroughly mix powdered ingredients. use a 0.01g scale to measure salt and stabilizers. -separate eggs and set yolks aside. freeze whites for other use. -measure smaller portion of milk and trimoline into blender. -set blender speed to create a vortex; add powdered ingredients. cover and blend on high for 30 seconds to disperse the stabilizers. -heat larger portion of milk and all cream on stovetop to 95°C / 203°F. (ideally use a relatively narrow vessel that’s easy to pour from and that minimizes evaporation. -when milk/cream reaches temperature, pour just enough into bag to saturate the grounds. start timer set for 3 minutes 30 seconds. -agitatate briefly and let the grounds sit with the bag unsealed. -after 30 seconds add the remaing hot milk/ cream. push out as much air as possible and seal the bag. –agitate gently for remaining time. -when time’s up, plunge bag into ice water bath. agitate to chill. get it down to about 7°C / 45°F. Don’t fully chill and crystalize the fat, or it will become viscous and difficult to strain. hold in refrigerator if you’re preparing more than an hour ahead of time. If mixture gets thick, try warming it slightly in room-temperature water right before straining. -pour mixture into 1gal ziplock bag. -add weight (recommended, to keep bag from floating) and evacuate the air. -gently agitate bag after 15 minutes and 30 minutes. if you see air accumulated in the bag, release it, and carefully reseal bag. -Drop circulator temperature to 75°C / 167°F. Uncover the container if was covered. -cook in water bath an additional 30 minutes to set custard, hydrate stabilizers, denature milk proteins. -mix will be pasteurized (pasteurization time after reaching this temperature is under 2 minutes). -remove bag from water bath. open and pour hot mix into clean blender container (or a square container if using a homogenizer or stick blender). remove weight (with tongs). use bag to squeegee off any mix. temporarily seal bag and keep handy. -blend on highest speed for 30 seconds to homogenize. -pour mix back into ziplock bag. -chill bag in ice water bath (use ice bath to evacuate the air when sealing bag). carefully agitate to cool. Try to cool to refrigerator temperature. -refrigerate at least 8 hours, below 38°F / 3°C to age mix / pre-crystalize fat. -pour into ice cream machine: snip off bottom corner of bag, and squeeze out mix as if using a pastry bag. or squeeze out into an intermediate container that’s easy to pour from. -spin in the ice cream maker. With a mulitispeed machine, use a slow setting (this recipe works best with a low overrun). Ideal drawing temperature is 23°F / -5°C. Go lower if machine can do so without excessive extra time. -evaluate when surface texture of ice cream first looks dry. if it needs more overrun, continue on higher speed. if it needs to cool more, continue on lower speed. -harden for several hours (preferably overnight) in a cold freezer. freezer should be set to -5°F / -20°C or lower. Ice cream will have to warm up several degrees before serving. 20 to 30 minutes in the fridge works well. Ideal serving temperature is 6 to 10° F / -14 to -12°C. -Commercial or homemade coffee extract, made with alcohol: basic coffee, roast, and bitter flavors. Flat. Little fruit or liveliness or lighter aromatics. -“Instant” infusion into alcohol, made with whipping siphon and nitrous oxide: similar to conventional extract, but more mid-rangey and less bitter. -Coffee infused into water, brewed as very strong coffee (typically press-pot style) and strained. Extra water compensated for by balancing recipe and adding milk solids: typical ice cream shop coffee ice cream flavors, emphasizing roast and base coffee notes. Brighter flavors and aromas muted. -Coffee mixed into simmered milk or cream, brewed as it cools, for 10 to 30 minutes: standard coffee ice cream flavor. Fairly flat. Slighty bitter and overextracted tasting when brewed strong. Little fruit or aroma. -Coffee brewed into ice cream mix in sous-vide bag as mix cooks, at 75°C for 45 minutes: Prominent fruit and aromatic flavors, but a strong, metalic bitter imballance. -Coffee cold brewed into dairy overnight in fridge: Very weak relative to amount of coffee used. No bitterness, and likewise no acidity or aromatics. All midrange. Similar to instant coffee. -Coffee brewed with dairy in sealed bag, then chilled in bag before straining (similar to Japanese iced coffee method). 75°C, 4 to 7 minutes: Good aromatics and acidity. Midrange flavors undeveloped. Metalic bitterness present and out of balance. -Coffee brewed with dairy in sealed bag, then chilled in bag before straining. 93°C to 95°C, 4 to 7 minutes: Fairly well developed coffee flavors, including aromatics and acidity. Metalic bitterness still somewhat present and out of balance. -Coffee brewed with dairy in sealed bag, then chilled in bag before straining. 96°C, 4 to 5 minutes: Fuller range, 3-dimensional, better balanced flavor. Still too much metalic bitterness. -Coffee brewed with dairy in sealed bag, then chilled in bag before straining. 96°C, 3 minutes: Full range, 3-dimensional, well balanced. Only slight remaining metalic / bitter notes. Brought mostly into balance by adjusting salt and acidity. -Coffee brewed with dairy in bag, allowed to bloom before sealing, then chilled in bag before straining. 96°C, 30 second bloom, 3 minutes sealed brew: Full range, 3-dimensional, well balanced. Very slight remaining metalic / bitter notes. Easily brought into balance by adjusting salt and acidity. consider preparing the coffee infusion separately, up to a day in advance. Store refrigerated in sealed bags after straining. Ok, I made another batch and included the blooming step. It's a major improvement. The recipe now reflects this change. The flavor still has a slight metalic / bitter imbalance when the ice cream is freshly mixed, but this dissipates very quickly. After hardening, the flavors are now even better balanced and full. The origin quality of the coffee really comes through with this method, augmented only slightly by the sherry vinegar, and by caramel flavors (not sure where those are coming from ... possibly from the roast profile of the coffee itself).